A peaceful snail, will not bother tank inhabitants. However, should not be kept with aggressive fish that may attack it such as Loaches or Pufferfish. Omnivorous, will graze around the environment, will eat plants, dead and decaying matter, and algae wafers. Prefers fairly still but well oxygenated water. Can survive in outdoor ponds and found throughout waterways in Europe. When found in a tropical aquarium, the snail will be much more active and prolific. A fast moving snail. 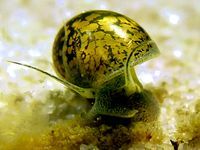 This snail can often come into fish tanks as a pest snail hidden away in plants and will multiply in number. The juveniles are small, initially about 1 mm in diameter. Their shells may be clear and transparent for the first to two months of life depending on water conditions. The adults have a smooth brown speckled oval shell with 3-4 whorls, the last whorl of the shell is very much expanded, so it's larger than all of the remaining spire. Has slender antennae and does not possess an operculum. This page was last edited on 8 November 2018, at 17:07.